Earth Day is recognized in April each year. In view of recent predictions that the world will end in 12 years unless we get rid of fossil fuels and completely revise our economic system, it is well to review the track record of past predictions. “We have about five more years at the outside to do something,” ecologist Kenneth Watt declared to a Swarthmore College audience on April 19, 1970. “We are in an environmental crisis which threatens the survival of this nation, and of the world as a suitable place of human habitation,” wrote Washington University biologist Barry Commoner in the Earth Day issue of the scholarly journal Environment. “It is already too late to avoid mass starvation,” declared Denis Hayes, the chief organizer for Earth Day, in the Spring 1970 issue of The Living Wilderness. April 22, 2002, the Australian Broadcasting Company predicted “Across the world, coral reefs are turning into marine deserts. It’s estimated that more than a quarter have been lost and that 40 per cent could be gone by 2010.” The reality: At the time of the broadcast, world coral reefs where estimated to be about 255,000 sq. km. So, by 2010, that should have dropped to 153,000 sq. km. But according to World Resources Institute , as of Feb. 2011, coral reef area is estimated to be 249,713 sq. km. March 20, 2019, “Heat records set twice as often as cold ones in US” Arizona Daily Star. The article ignores heat waves of the 1920s and 1930s. See a complete debunking here. As Bjorn Lomberg wrote and documented in the “Skeptical Environmentalist,” most claims by environmental groups are not supported by the facts and the environment is in much better shape than we are led to believe. People often say that we’re heading into the unknown with regards to CO2 and the planet. They say we can’t know, for example, what a 2°C warming will do because we can’t do the experiment. This is seen as important because for unknown reasons, people have battened on to “2°C” as being the scary temperature rise that we’re told we have to avoid at all costs. But actually, as it turns out, we have already done the experiment. Below I show the Berkeley Earth average surface temperature record for Europe. Europe is a good location to analyze, because some of the longest continuous temperature records are from Europe. In addition, there are a lot of stations in Europe that have been taking records for a long time. This gives us lots of good data. Temperatures were fairly steady until about the year 1890, and from 1890 or so to 2013, temperatures in Europe rose by about 2°C. Which of course brings up the very important question …We’ve done the 2°C experiment … so where are the climate catastrophes? 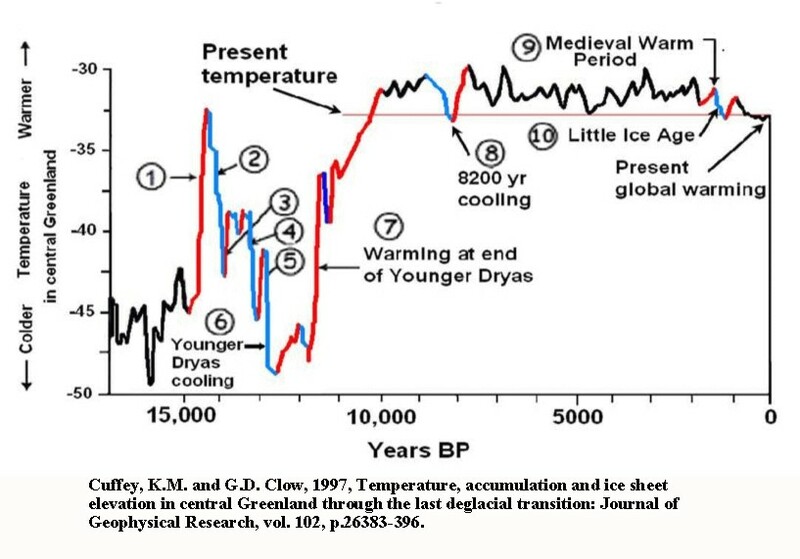 During the past 15,000 years, natural variation of temperature has been more than 2°C in many cycles. Federal agency websites should only contain scientific facts about climate change, not left-wing propaganda. This means numerous existing websites must be corrected to reflect climate realism or taken down altogether. In multiple federal agencies, political operatives posing as civil servants continue to propagate numerous global warming myths and alarmist claims, even though President Donald Trump has repeatedly said he and his administration are committed to promoting climate realism. For example, many federal agency websites that address climate topics aggressively push the assertion global warming is a human-caused crisis resulting from fossil-fuel use. A new study, “Global Warming Energy Restrictions Threaten U.S. National Security,” shows climate change is not a danger to U.S. national security. A review of all risk factors reveals that imposing carbon dioxide restrictions on the U.S. economy would diminish, rather than enhance, American military preparedness. After the author organized groups of labor unions and environmentalists to promote renewable energy, the real truth hit. In a spectacular climate alarmist policy failure the European Union dumped its “carbon neutrality by 2050” commitment and targets driven by the sacred but highly arbitrary and unsubstantiated 1.5 degree C global temperature “limit” and ended its Brussels summit with no climate commitments or targets for year 2050. The EU heavy weight Germany along with other Eastern European countries including Poland, Hungary and Czech Republic refused to agree to any climate commitments or targets for year 2050 which had been expected to occur at this highly touted EU summit meeting. “The cost of Germany’s “Energiewende” (energy transition) is enormous: some 200 billion euros by 2015 – and yet with minimal reduction in CO2 emission. In fact, coal consumption and CO2 emissions have been stable or risen slightly the last seven to ten years. In the absence of a miracle, Germany will not be able to fulfill its self-imposed climate commitments, not by 2020, nor by 2030. “To fulfill the German target of getting 60% of their total energy consumption from renewables by 2050, they must multiply the current power production from solar and wind by a factor of 15. They must also expand their output from conventional power plants by an equal amount, to balance and backup the intermittent renewable energy. Germany might import some of this balancing power, but even then the scale of this endeavor is enormous. Green New Deal Would Barely Change Earth’s Temperature. Here Are the Facts. Even if Americans were on board with this radical change in behavior and lifestyle, it wouldn’t change our climate. In fact, the U.S. could cut its carbon dioxide emissions 100 percent and it would not make a difference in abating global warming. Perhaps the worst aspect of the “Green New Deal” (GND) recently proposed by Representative Alexandria Ocasio-Cortez and Senator Edward Markey is that the authors have lost (or possibly never had) all perspective on climate change. They are acting as if climate change were as bad a problem as the Great Depression, and that another “New Deal” is required for the US to survive. This shows that they they really have no understanding of climate change and that Congress should never appropriate any funds for the purposes proposed by the GNDers. If they have such a bad understanding of this problem, what would they do if there actually were a real problem? It makes one worry that the GNDers might be willing to start World War III on the basis of nothing. The larger view is that prior to about 1860 the world was suffering from the Little Ice Age, the coldest period for several hundred years with many adverse effects on humans and their crops. What the world needed was higher temperatures, not colder temperatures. During the 1930s the world began to get what it so badly needed, warmer temperatures. So then there was some warming again from the 1970s until recently. And now the climate extremists want lower temperatures rather than realizing that the present relative warmth is just what we needed. There are now increasing indications that temperatures may fall again over the next decade or two because of a weakening sun. The temperature changes to date are entirely consistent with past variations in climate temperatures. Clearly the best thing to do is nothing. But the GND supporters are desperate to claim an emergency and spend almost one hundred trillion dollars of taxpayer and ratepayer money claiming that the problem they see must be solved in 12 years if the world is to survive. We do not even understand how the climate system works, let alone how to solve the alleged problem. As explained on this blog and my Book, everything points to bad “science,” not an emergency. How crazy can you get! We should be thankful for the minor temperature increases during the Twentieth Century and maybe even hope for a little more, not sacrifice everything to solve a non-problem that we should be thankful for. The climate alarmists should not be given even $1 of taxpayer or ratepayer funds until and unless the “consensus” science may be shown to be fully valid by independent scientists using the scientific method. It is the responsibility of the GNDers to show the validity of their “science,” not climate skeptics. Consequences of Cuomo’s Climate Agenda Hit Close to Home. His Home. The unintended consequences of New York Gov. Andrew Cuomo’s global warming crusade are hitting close to home—literally. The Cuomo administration has blocked major natural gas pipeline projects. At the same time, however, natural gas was becoming an increasingly important part of New York’s electricity and heating mix. The utility Consolidated Edison put a moratorium on new natural gas hookups across parts of Westchester County, including Mount Kisco, site of the Democratic governor’s residence, according to The New York Times. NOAA has updated its coastal tide gauge measurement data through year 2018 with this update now providing 30 years of actual data since the infamous 1988 Senate hearings that launched the U.S. climate alarmist political propaganda campaign. 1) Support private property rights. 2) Support multiple use management of federal lands for agriculture, livestock grazing, mining, oil and gas production, recreation, timber harvesting and water development activities. 3) Support a balance of environmental responsibility and economic benefit for all Americans by urging that environmental policy be based on good science and sound economic principles. The Constitution is the real contract with America. People for the West – Tucson, Inc.
People for the West – Tucson, Inc. is an Arizona tax-exempt, 501(c)(3) corporation. Newsletter subscriptions are free. In accordance with Title 17 U.S.C. section 107, any copyrighted material herein is distributed without profit or payment to those who have expressed a prior interest in receiving this information for non-profit research and educational purposes only.